Gayle and Gillian Blakeney are identical twins who performed together as actresses and as a Dance Pop duo in the 1990s. They were born in Brisbane, Queensland, Australia on July 9, 1966. Gayle is the older by 9 minutes. Gayle and Gillian then starred in numerous television commercials around Australia - including a series of Kelloggs Corn Flakes commercials. They then decided to take the next step and auditioned for a lead role in a children's telemovie pilot called "Earth Patrol" starring Spike Milligan. Gillian won the lead children's role of Cassie. However, the producers were delighted with both twins auditions and planned to write Gayle into the series as her twin sister once the pilot was successful. Unfortunately, the pilot was not accepted. The sisters continued their career in 1979 when they appeared in a video clip for the Australian group The Monitors, "Singin' In The '80s". They also appeared in other music videos by The Monitors between 1980 and 1982, most notably "Nobody Told Me" (dressed as schoolgirls in a jail) and "Having you around me" (dressed as 'beach babes'). In 1983 they joined the team on the highly successful national children's programme "Wombat". They enjoyed their roles as reporters for the next seven years. In 1990 they joined the cast of the soap opera Neighbours as Caroline (played by Gillian) and Christina (played by Gayle) Alessi. Gillian and Gayle left the show at different stages during 1992. Following the success of former Neighbours actors Kylie Minogue and Jason Donovan as recording artists, the Blakeneys went to England in 1991 to record with Stock Aitken Waterman as "The Twins". The resulting single, "All Mixed Up," became a modest club hit that year, and peaked at #77 in the UK Pop chart that year (peaking at #74 in Australia). After parting with Stock Aitken Waterman the Blakeneys made a brief return to Neighbours, eventually leaving the show in 1992. 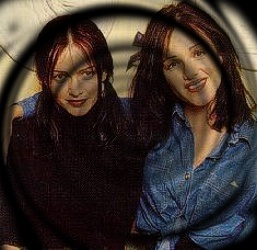 In 1993/ 1994 they released two singles in the United Kingdom as "Gayle and Gillian", "Mad If You Don't" (number 75 in 1993) and a cover version of Prince's "I Want To Be Your Lover" (number 62 in 1994). Afterwards the two made a brief return to television, this time as co-hosts on the UK game show Take Your Pick. In 1994 the sisters moved to the United States (where they still reside today) to pursue acting roles, landing guest spots on various film and TV projects. In addition, their videos for "All Mixed Up" and "Mad If You Don't", (and their early 1980s Monitors videos) can be found on YouTube.